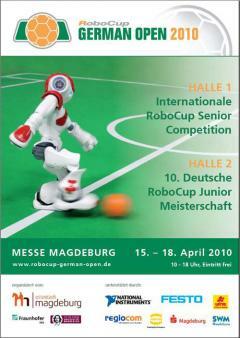 This competition will introduce a new league in RoboCup 2010 which takes place in Madgeburg/Germany from April 15-18. The idea ist to realize a logistics competition for a virtual production plant. Use a ready to start robot platform Robotino®. Register now until March 19, 2010! This competition will introduce a new league in RoboCup 2010. The idea ist to realize a logistics competition for a virtual production plant. Use a ready to start with robot platform avoiding the necessary of developing well known technical equipment but focus on the main goal to use the robot systems as a platform to demonstrate new developments in artificial intelligence and solutions for industry relevant multi-agent tasks. The virtual plant consists of a competition field of size 6m x 6m. The production machines are represented by RFID writing/reading devices which can change the product identification of work pieces. One team has the task to schedule and realize the logistics and production process, the other one should try to disturb or to prevent the scheduled processes. Each team consists of three robots working completely autonomously. The robots may communicate via WLAN and/or OPC. Each competition run consists of two halves á 10 minutes. After the first half the roles of the teams will be changed. Depending on the type the machines can only produce well defined products. The locations of the machines are known but the allocation of the type to a machine is not known to the teams at the beginning of the competition run. At the beginning teams have therefore the great challenge to find out which machines need what kind of material in order to produce a certain product. Winner of a competition run is the team with the most final products delivered. A final product consists of a Hockey-puck with a well defined RFID identification. For delivery such puck must be hit into the delivery store. Of course, the opponent team will try to prevent this.